The Go-Home Club isn’t the name of a boring high-school extra-curricular group. Oh no. They’re a group of kids who’ve realized that their entire reality is actually a digital construct ruled by the scintillating virtual idol μ. Get ready to fight your way through rabid high-schoolers and malicious music producers, because The Caligula Effect is out now in the Americas exclusively for PS Vita! It’s available as a digital deluxe bundle that includes the game, a PS Vita theme featuring µ and various characters, 19 avatars, and a swimsuit costume DLC pack for $39.99/CA$53.49. 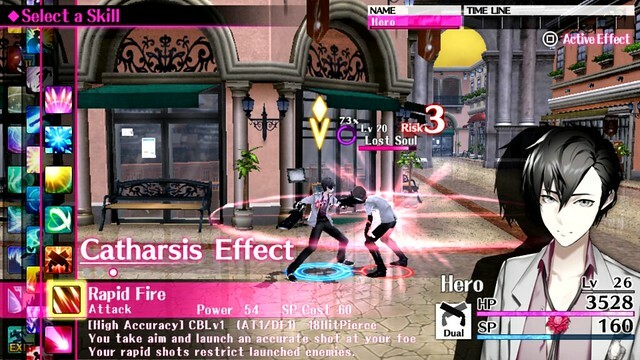 With 500+ NPCs to build relationships with, a rewarding battle system called “Imaginary Chain,” original songs by Japanese producers such as (Oster project, 40mP, 164, cosMo@Bousou-P, and more), and a dark story about inner-traumas from Persona series veteran Tadashi Satomi, The Caligula Effect is the perfect escape for those craving a JRPG adventure on the go. Enemies tend to cluster as the story progresses, putting a halt to your journey. It may help to avoid the enemy’s line of sight to get back on track. Sticking to the walls of the dungeons will be a useful strategy and possibly a lifesaving one! If a Digihead cluster is difficult to avoid, tackling one enemy at a time may be your only option. When approaching a cluster, press the X button to draw the attention of a specific enemy. Not only is the Perception Effect useful when dealing with a blockade, if used successfully, it acts as a preemptive strike, starting the battle with more Risk. Progressing the Go-Home Club’s individual stories gives you a deeper understanding of who they are outside of the world of Mobius. To advance Character Episodes, increase your Affinity with the Go-Home Club members or progress the storyline. μ also has her own Character Episodes in the form of memory remnants manifested throughout Mobius. Listen to what she has to say! With a multitude of enemies to fight, students to befriend, and traumas to resolve, many things can be happening all at once. 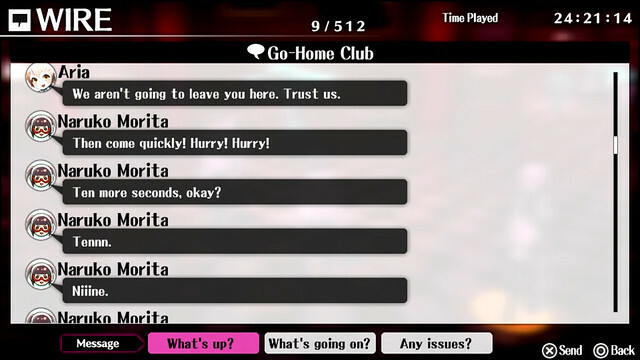 To help you get back to the main storyline, utilize the Go-Home Club’s chat room! Aria will be able to give you some advice to lead you out of the dark. Scattered throughout the world of Mobius lie green sparkles called world wonders. Observing these tiny glimmers will reward you with points needed to learn powerful skills. Some also serve as a resolution point to Trauma Quests, so keep a note on where specific world wonders will benefit you on your journey. Be sure to find them all — some may even lead to a World Reward! Accessing World Reward content may sound like a daunting task, with some words having a one-in-ten-thousand chance of being acquired. Though an intimidating effort on its own, with the help of other players and the magic of the internet, you will be able to enjoy the hidden areas of Mobius. There are three types of Stigma: Manifestos which act as your weapons, Core Beliefs which provide defense, and accessories in the form of Traumatic Memories. Each Stigma provides a variety of beneficial effects or special skills, allowing you to enhance your party in unique ways. They may also be a key in solving Trauma Quests, so collect as many as you can! Speaking to and befriending 500 NPCs has its rewards. You can invite them on your journey and fight alongside allies that may be equal if not more powerful than the Go-Home Club members. Use items that grant the hidden stat “Charm” to accelerate your Affinity progression. 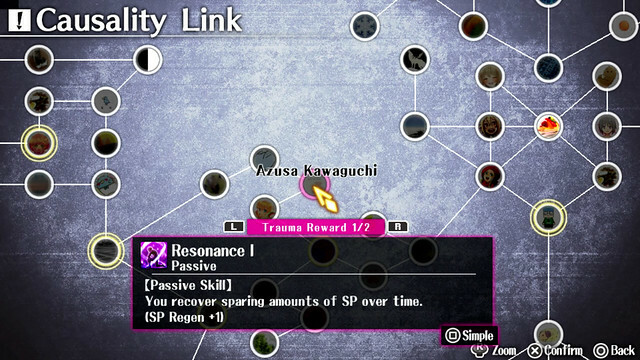 Solving Trauma Quests rewards you with powerful passive skills you can access on the Causality Link window. Many of the skills are unique to both the Hero and Go-Home Club party members so accumulate them to help against powerful enemies! Utilizing the Causality Link can act as a map to assist in solving difficult Trauma Quests and can also guide you on your Trophy quest! Going all out on the offensive can be a good strategy for some battles, but by appropriating an evasive style of combat, a perfect 1 Turn Defeat can be achieved. This can be managed by exploiting Dash on the Affection Effect skill reel. It’s not as big of a waste of a move if it means you get to complete your Chain Bind! By the way, is it true that the frame-rates are terrible? Is there an option to mitigate this issue? The trailer may have been made on an early build of the game. Heard many say there is no Frame Rate problems. One or two reviewers say there is slowdowns. What I saw when someone was streaming the game, it ran smoothly. The frame rate is atrocious. I don’t mind, but some people will. When there’s many people attacking at once, it slows to a crawl. I’m curious as to why the game is offered on the Store by itself for the same price as the bundle….. I been wondering about this as well… maybe for when they do discounts later… but still very strange. We’re getting that fixed! It’ll just be the bundle. I had no idea the game involved so many features! I just wish you were physical… i would have picked you up day 1… digital… Vita… waiting… But Vita Exclusive… conflicted…. By the way, does this game has multiple endings? Aquria/Atlus: We will appreciate a PS4 port. Even if it’s the original assets. Are there any gay characters in the game?